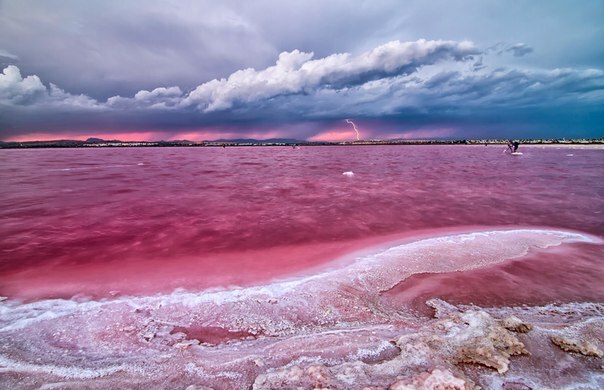 Have you heard about pink salt lakes of Torrevieja called natural spa in Spain? Microclimate created the largest salt lakes in Europe in Spain in the town of Torrevieja and La Mata, has been declared one of the healthiest in Europe, according to the World Health Organization. The pink color of salt lake of Torrevieja, caused by the presence of salt-loving archaea – halobacteria genus Halobacterium (in the world there are about 3,5 billion years), as well as a single living organism on the planet Earth can exist in water with a high salt concentration – Dunaliella salina green algae Dunaliella salina.